Colours of a rainbow. Cross sections of bows of different colours from 0.7 mm diameter raindrops. The bow actually seen (lower section) is the sum* of all the individual coloured bows. Compare with the classical rainbow from large raindrops. The purples, pinks and greens of supernumeraries are complex mixtures. In the example, the first violet band at 40.6º is made from blues of the main primary bow plus reds and yellows of the first supernumerary. The second violet band comes from primary bow violet with some reds from a second supernumerary. The greens are very desaturated and owe much of their apparent colour to contrast with the adjacent pinks and purples. * The bows were calculated by AirySim using Airy theory, spherical monodisperse drops and convolution over the solar disc. 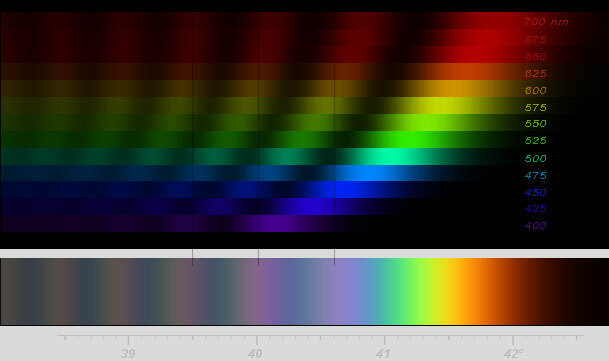 The composite bow colour intensities were weighted by the spectral intensity distribution of sunlight at the earth's surface.